There are now some 30 million entries in the National Archives Catalog at catalog.archives.gov, according to my best understanding of it. Those entries can be descriptions of governmental entities, record series, files from within those record entries, individual items, and digital images of actual records. The following information comes from the NARA’s Digital Public Access Branch, which manages the Catalog. 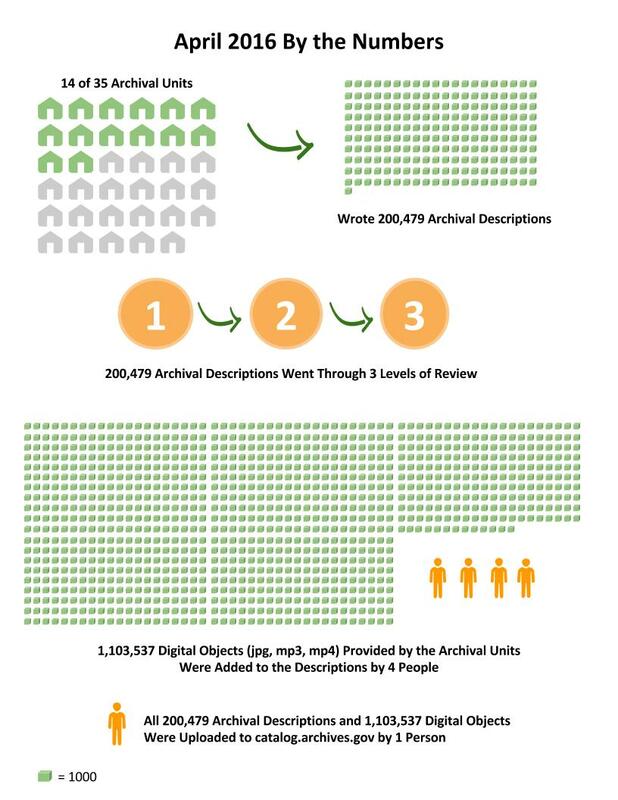 This posting takes a peek behind the curtain at the number of offices and people at the National Archives it takes to add descriptions and digitized records to our Catalog. April 2016 was a fairly ordinary month for the number of descriptions at the National Archives, but when you look at the numbers in this context it is quite extraordinary. What is an archival unit? Think of an archival unit like an office that specializes in certain kinds of records. We have units based on the kinds of records they hold (e.g. Textual Records or Still Pictures); based on their regional location (e.g. the National Archives at Atlanta, or the National Archives at Fort Worth); and the Presidential Libraries (e.g. the Franklin D. Roosevelt Library or the John F. Kennedy Library). What is an archival description? An archival description describes the records we hold in the National Archives. Series descriptions describe records that were accumulated and used together during a distinct period of time. The records in a series are usually arranged in a particular order. A file unit usually describes the equivalent of a folder. A file unit could have a single record in it or many. An item describes a single record – it could be a letter, a report, a photograph, a film, or even a memorandum. The 200,479 descriptions written in April include series, file units and items. What are the three levels of review? A staff member writes a description in their archival unit. Then a description reviewer in that office reviews the description and sends it to the Digital Public Access Branch. In Digital Public Access the description is reviewed and edits are sometimes suggested or made to meet the National Archives’ description standards. Then once corrections are made (if needed) it is reviewed once more before it is uploaded to the Catalog. What does “adding a digital object” mean? Archival descriptions are written descriptions of records and when possible we also add images, sound or video to the descriptions. In this process we marry a digital file (e.g. jpg, pdf, mp3, mp4) to the written description. Most of the time this can be done in an automatic process after the data is formatted correctly, but sometimes it is a manual process to add the data into the description for every single page. Incoming and outgoing correspondence, administrative files, witness lists, records supporting hearings, chronologies of the financial crisis, risk model data, press releases and other records relating to the Financial Crisis Inquiry Commission (FCIC) interaction with the media. Geologic, geophysical, and geochemical studies and other records created by personnel connected with Project Chariot. Project Chariot was one of several projects planned under the auspices of Operation Plowshare which was developed to explore the use of nuclear explosions for peacetime construction. Project Chariot was a plan to use nuclear blasts to create a harbor at Cape Thompson, Alaska. Correspondence, memoranda, messages, and an after action report pertaining to the planning and preparation for the Bob Hope Christmas programs in Vietnam. Included is an after action report for Operation Holly; diagrams of stage constructions and seating arrangements; records relating to transportation arrangements; and itineraries for the visits. Countdown to Release of the 1950 Census! A is for …. accurate authentic ancestors.